This video was taken on an investigation performed for one of our associates on a rental property, which was several acres in size. 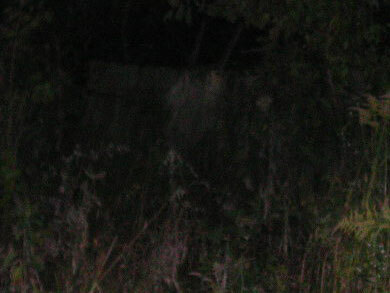 There were no light sources nearby, and we were not able to recreate this effect once the "orb" disppeared. The actual length of this video was approximately 3 minutes. Some of the most puzzling aspects of this video are the shadow across the bottom half of the "orb," and the way it appears to move between the branches. We have not yet found anyone who could provide a natural explanation for this phenomena. The following picture was taken by: Lee Weaver AKA spiritmagnet2000 Email Yahoo group: spookyimages on the same evening as the video. There appears to be what looks like an old-fashioned child's fancy pink dress in motion in the center of the close up. 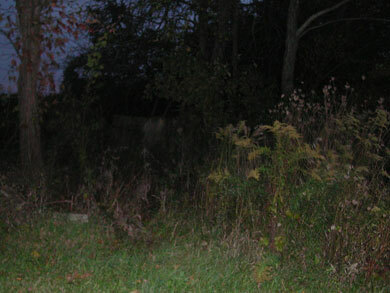 At the time, Lee was picking up the presence of a family in this general area.